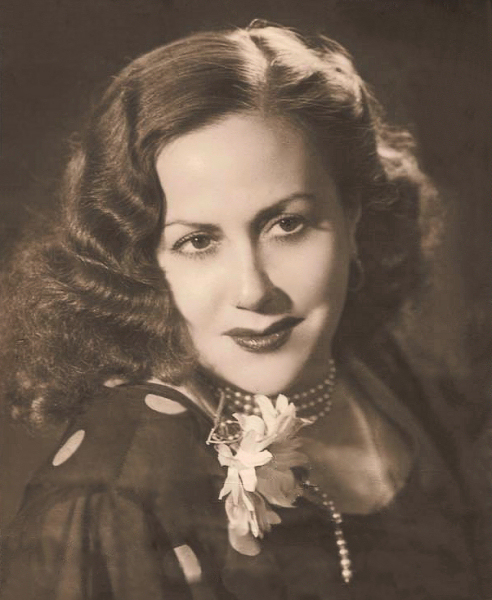 She was married in 1947 to the composer of many of her songs, Enrique Ramírez de Gamboa, Cipri, and also worked with her daughter Olga María, with whom she recorded the LP Madrid Entre Cuplés y Canciones. One of the defining characteristics of Olga Ramos’ style is the double entendre that has always characterised cuplé, the ability to sing saucy lyrics that the audience would quickly pick up. Here are a couple of examples of this very personal style she brought to the genre. After a short retirement she reappeared in 1968 in the show Las Noches del Cuplé in the El Último Cuplé theatre in Madrid, where she performed until finally retiring in 1999. Her presence on the stage of Las Noches del Cuplé for over thirty years without a break made her one of the leading figures of Madrid casticismo (Castizo means genuine, born and bred, more or less) and perhaps one of the last of a long line of popular tradition and customs symbolised by Manila Shawls, organ grinders, chulapas (a traditional fiery, sparky Madrid female character), cuplés and chotis (the traditional Madrid dance). If Olga Ramos is remembered for her reinvention of cuplé at the end of the twentieth century, we shouldn’t forget that she was first and foremost a musician. Music was her passion. We had heard her play the violin but now with on-line resources and previously “lost” recordings being made available, we can enjoy the following clip in which she interprets El Gaitero de Gijón. Here her virtuosity on the instrument makes it sound like the Asturian bagpipe, imitating the sound of both the chanter and the drone. This recently rediscovered recording is from the Televisión Española programme Retrato en Vivo originally broadcast in 1981. She made her last recording at the age of 86 when she still didn’t have (as she said) “wrinkles in her voice” for the LP Puro Cuplé with her daughter, Olga María Ramos. and here, to end, we see her singing the famous Chotis Madrid, accompanied by her daughter, who has carried on the family musical tradition. Olga Ramos died in Madrid on 25 August 2005 at the age of 87. Wow what an incredibly rich, lyrical voice she had, Maki. Amazing timing there, I thought and a an ability to project her voice for singing on stage. Ideally suited for comic songs, too. The songs were great, but I’m so glad you posted the clip of her playing the violin, because that (for me) was the best one. Lovely.